Using page drill-down links, you can dynamically navigate to pages and reports within your portal. This feature is especially useful in portals with multiple pages, because it allows you to link to a specific item or point in your content. You can also pass a parameter from a link to its output, such as a chart or report. Create Drill-Down Links. Create hyperlinks within a report, which you will later configure to point to a page and parameterized content. Create Parameterized Content. Create charts and reports to which the drill-down links will point. Set Up a Portal for Drill-Down Links. Create the landing page for the drill-down links. Configure Drill-Down Links. Specify the output location for the drill-down links. In this step, you will create a simple report with hyperlinks, which you will later configure to point at a specific output in a portal. Sign-in to WebFOCUS as a designer or administrator. Right-click a folder, point to New, and then click Report. Select a data source file and click OK. 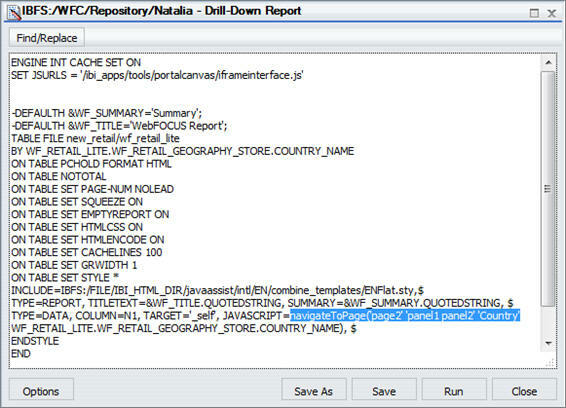 Drag fields from the Data pane onto the canvas or into the Query pane to create a report. 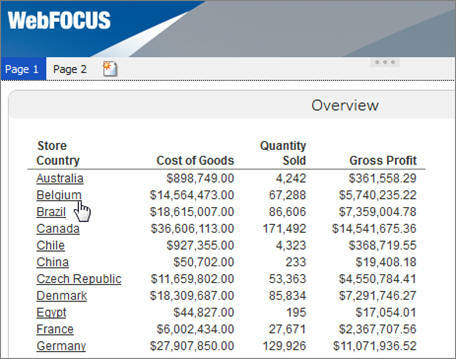 For more information on how to create a basic report, see the Getting Started With InfoAssist chapter, in the InfoAssist User’s Manual . Click the field that you want to use for the drill-down function to highlight it. In the Field tab, in the Links group, click Hyperlink. Select the Refresh BI Portal radio button. From the Refresh list, click All Pages. Note: Remember the name of the parameter. You will use it in the subsequent steps. In the Type list, click Field. In the Value list, click the field that you have highlighted, and then click OK. 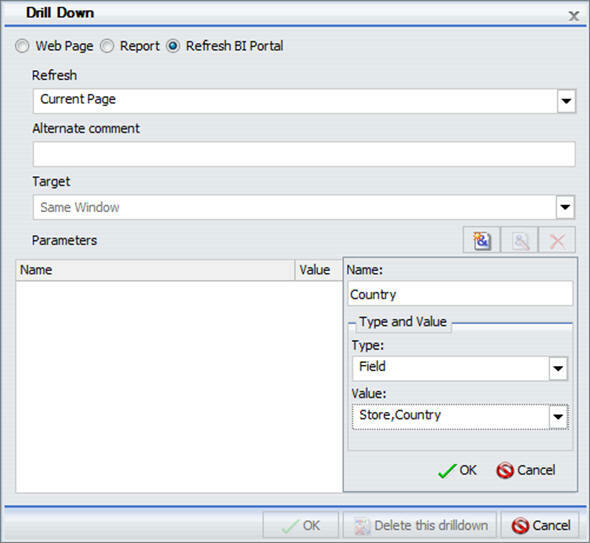 The following image shows the example of the Drill Down dialog box, where Country is the name of the parameter. The drill-down links are added to the entries of the highlighted field. Note: The drill-down links remain inactive and evoke no error messages until the target value is configured. In this step, you build parameterized reports and charts that will serve as outputs for your drill-down links. From InfoAssist, click the application button, then click New. 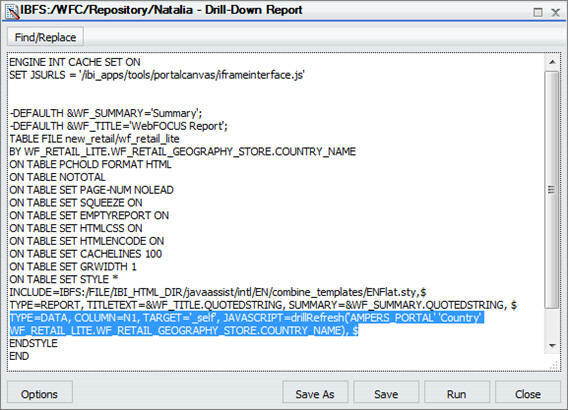 Select the same data source file that you used for the drill-down report, and then click OK. In the Data tab, in the Filter group, click Filter. In the Field drop-down list, click the same field for which you have created drill-down links in the previous report. Keep the Equal To default value. In the Value dialog box, set Type to Parameter, keep the Simple radio button selected, and type the name of the parameter that matches the parameter in the drill-down report, and then click OK. 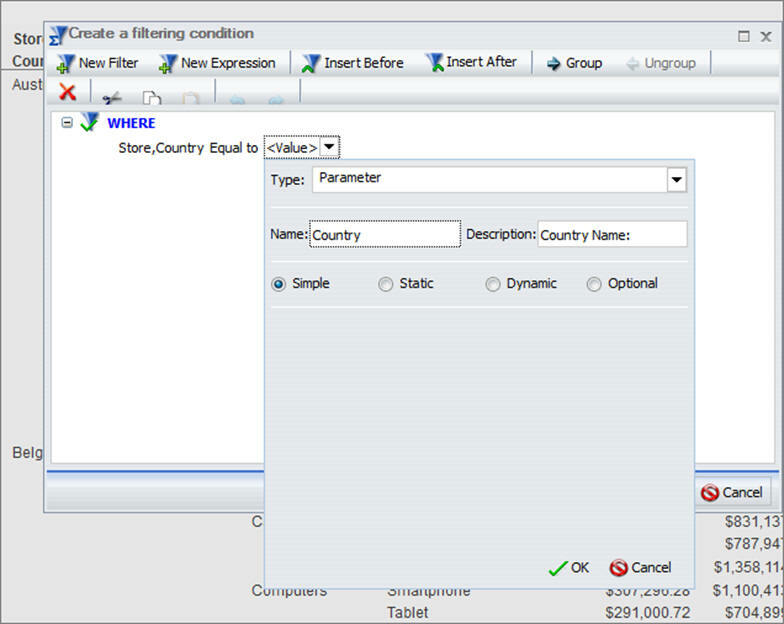 The following image shows an example of the filtering condition, where Country is the name of the parameter. Save the second report and close WebFOCUS InfoAssist. In the Resource tree, right-click the new report, point to Edit With, and then click Text Editor. is the name of the Parameter that you have previously created. 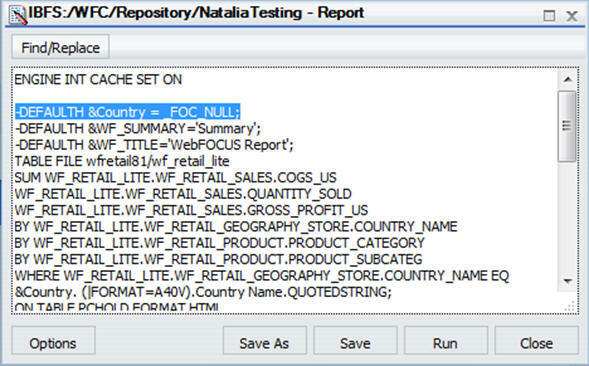 The following image shows an example of the report syntax, where the _FOC_NULL statement is added with Country as a name of the parameter. Note: Instead of an auto-prompt form, standard for parameterized content, the report displays all fields by default. Click Save and close the Text Editor. Repeat steps 1-12 to create more content. In this step, you will create a landing page for the drill-down links and incorporate the drill-down report that you created in Step One: Creating Drill-Down Links, to a Portal. In the Resource tree, right-click the Portals node, the click New Portal. For more information on creating a new portal, see Launching the Portal Designer. Click the New Page button . Note: In the Properties panel, note the value of the Page Name field. You will use this value in the subsequent steps. The Choose a Layout dialog box opens. Select the layout type for your page. In this example, we select Two Column layout. In the Insert tab, in the Containers group, click Panel. A Panel container is inserted inside the first column. Click the content area of the container. 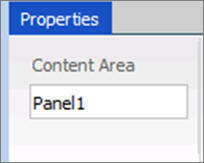 In the Properties panel, type the new value in the Content Area field, as shown in the following image. Note: This value will be used in the subsequent steps. Repeat steps 7-10 for other columns. In the Insert tab, in the Content group, click WebFOCUS Resources. Drag the drill-down report to the Page1 canvas. Drag the remaining content to the panels on Page 2. In this step, you edit the drill-down report to specify the output location for the drill-down links. In the Resource tree, right-click the initial report, point to Edit With, and then click Text Editor. The report opens in the Text Editor window. The following image shows an example of the drill-down report syntax. You will need to edit the highlighted line. Change AMPER_PORTAL to the name of the landing page for your drill-down links. After the page name, insert the names of the panels, separated by spaces. Ensure that you enclose these names in single quotation marks. The following image shows an example of modified drill-down syntax. Optionally, customize your portal to achieve the desired style and layout. In the Resource tree, right-click your new portal, and then click Run. At run time, click any link on the first page of the portal. The second page displays, and the panel refreshes to show the correct data. Note: If you drill down to a page that has changed, you will not receive an error message, and must ensure that your syntax values are set correctly. The following images show the drill-down function at run time.